This month, we are talking about what it means to have Fear Free vet visits! Every pet parent knows that taking your pup to the vet can sometimes be a trying experience for both you and your best friend. Read on to see what Blum Animal Hospital is doing to make vet visits a more enjoyable experience for you, your pet, and your veterinarian! Before we get into what it means to be “Fear Free”, let’s talk about the big issue: why are some dogs fearful when at the veterinary appointment? There are a few different reasons why dogs become fearful when visiting the vet. 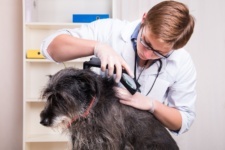 According to Dr. Marks, one reason may be that some dogs have previously had stressful or painful experiences at a veterinary office, groomer, trainer, or communal dog area. After this stressful experience, dogs can have an imprinted memory in their mind that affects their behavior when visiting a vet again in the future. 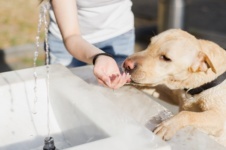 Dr. Marks explained that other dogs could have “underlying anxiety, stress involving personal space, or phobias surrounding colors, sights, sounds, or smells” as well. Blum Animal Hospital accounts for all of these factors when trying to create a fear free experience for their patients. If a dog is fearful at the vet, how does that affect the exam? We know that a relaxed and happy pet makes for a better and more thorough exam, so how does Blum Animal Hospital make a Fear Free experience for its patients? Blum has put a lot of work into making sure every pet has an enjoyable experience when visiting! The lobby at Blum has separate entrances for dogs and cats. 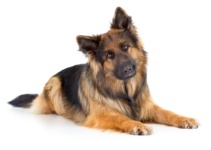 In the dog waiting room, Blum has Adaptil diffusers (plug-ins that diffuse Adaptil, a pheromone that calms dogs). In addition, staff members have bandanas that are sprayed with Adaptil that can be immediately placed on patients. For patients who do better in less communal settings, Blum staff can coordinate with the pet’s owner ahead of time to bypass the lobby and go directly into an exam room. During the exam, Blum veterinarians and technicians try to examine many patients on the floor, on nonskid mats, or on cushions for dogs with severe orthopedic or neurologic disease. All of these efforts and measures described by Dr. Marks help to make the experience as calming as possible for your pet. Is there anything a dog parent can do before and during a vet visit to help put their dog at ease? Dr. Marks recommends not feeding a dog immediately before a fear free veterinary visit to encourage your dog to be more interested in high reward food treats during the exam. For dogs who have a history of being fearful, anxious, or stressed, Blum recommends placing a Thundershirt or an Adaptil-sprayed bandana on your pooch. If you are driving to the vet, you can also spray your car with Adaptil at least 30 minutes before leaving for your visit to allow calming pheromones to take effect. Dr. Marks states that during the veterinary visit itself, the veterinarian and support staff will be demonstrating low stress handling and other strategies that may be new or visibly different to a pet parent. Blum wants this experience to be a team effort, and they want to encourage pet parents to help with offering treats at appropriate times and to learn new techniques for handling their pet at home (strategies for low stress nail trims, ear cleanings, medication administration, etc). We have mostly discussed dogs so far, but the care of our feline friends is very important too! How does Blum Animal Hospital make a vet visit Fear Free for cats? According to Dr. Marks, it is very important to start a cat’s vet visit at home. She and all of Blum’s staff encourage owners to leave your cat’s carrier out in your home days to weeks before the veterinary visit with the door open and treats or meals inside. Dr. Marks states that some behaviorists even suggest making the cat carrier part of the furniture in your home so that your cat is very used to seeing and being around it. Blum recommends that Feliway, a pheromone or hormone that relaxes cats, be sprayed in the carrier and/or your car before a vet visit. Some cat patients with significant fear, anxiety, or stress can also be given sedatives or anti-anxiety medication by the owner prior to the visit (after conferring with their vet and determining that sedatives are the best option). 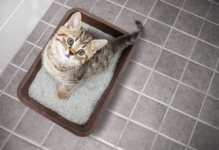 Once at Blum, Dr. Marks explains that cat owners will see that they have a separate cat waiting area (away from dogs) where owners can wait quietly, also with Feliway diffusers, and place carriers off the ground. In Blum’s exam rooms, they have Feliway-soaked towels and diffusers in addition to low stress handling by assistants. Blum’s staff will also discuss with you some strategies for medicating and/or treating your cat at home that follow the same Fear Free steps and procedures. 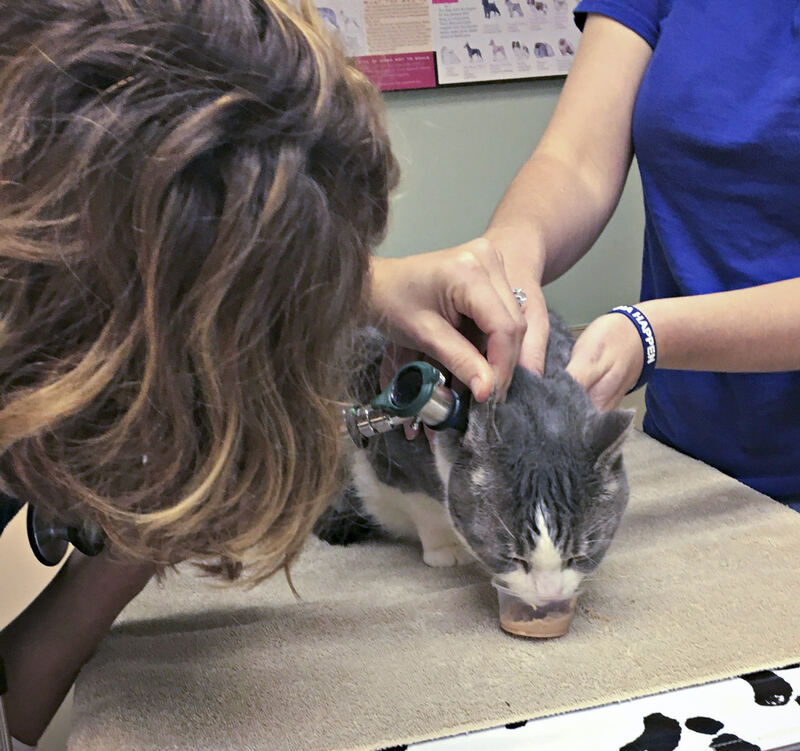 Blum staff also offer cats high reward treats, such as canned tuna and baby shrimp, throughout the exam, nail trim, blood draw, or other procedures. We know that being fearful at the vet is bad for any pet, but are there any major differences in how cats and dogs react when they are fearful? Dr. Marks explains that there are some major differences between how cats and dogs behave when fearful. Cats prefer to hide when they are afraid. They may make their body posture very small, they may crouch, they may place their ears flat to the side or backwards, and they may tuck their tail. Cats only “react” as a last resort (hissing, attempted biting, scratching, etc). However, dogs sometimes tend to react first when fearful. Dogs who are anxious or fearful will sometimes squint their eyes, flatten their ears to the side or to the back, make slow deliberate movements, and tuck their tail. Still, dogs are much more quick to react inappropriately through barking, lunging, or even attempted biting. As pet parents, we never want our pets to be afraid, and we know that it is best for them at a vet visit to be relaxed. What are the biggest benefits to making sure your pet has a Fear Free vet visit? Dr. Marks states that there are several benefits to making a veterinary visit Fear Free. 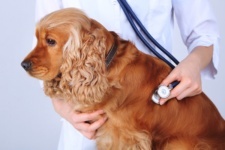 Fear free handling allows the veterinarian to perform a more complete and thorough physical exam. 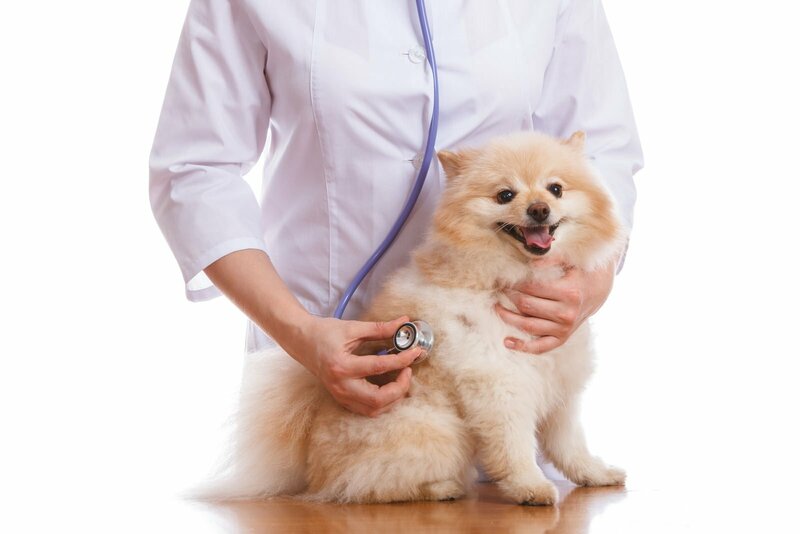 This enables your veterinarian to provide more proactive wellness recommendations and can help them to identify other signs of potential illness. Fear free, low stress handling strategies allow veterinary staff to perform blood draws, nail trims, x-rays, ultrasounds, and other procedures without sedation or significant restraint. Not only does this make the experience more peaceful for the patient and veterinary staff, it diminishes or eliminates the fear response in your pet for the next visit. A fear free cat or dog also helps to develop a fear free pet owner, which is also very important to your pet’s health and well-being! Now that we know all about the benefits of a Fear Free vet visit, let’s learn a little more about how Fear Free came to be! When was the idea of Fear Free initiated? What role has Blum Animal Hospital played in promoting the Fear Free philosophy and practice in Chicago? Blum Animal Hospital was the first practice in Chicago to have all associates Fear Free certified. Dr. Natalie Marks is one of four private practitioners in North America on the advisory board and also is a national speaker on implementing Fear Free methods into general practice. If a pet parent wants to set up a Fear Free visit at Blum Animal Hospital, how do they do that? Keep in mind that Fear Free strategies can be applied to any dog or cat visiting Blum Animal Hospital! At Blum, the staff recommends calling to set up an initial standard appointment if your cat or dog has no apparent behavioral concerns or previous history of difficulty when visiting the vet. If you have initial concerns regarding previous fear, anxiety, or stress (or if previous medical records indicate the recommendations for sedation or other calming strategies prior to the exam), Dr. Marks recommends having a phone discussion with the Blum staff to go over your options. Your pup or kitty’s next vet appointment doesn’t have to be a stressful struggle! Talk to the staff at Blum to help make your pet’s experience Fear Free! Thank you to Dr. Natalie Marks at Blum Animal Hospital for her insight into Fear Free vet visits! We appreciate her hard work in making sure that every Chicago pet has the best life possible! Blum Animal Hospital is located at 3219 N. Clark Street and has been caring for Chicago’s pets since 1952. They have been accredited by the American Animal Hospital Association (AAHA) since 1972. To learn more about Blum, their Fear Free certification, and the calming techniques they use, check out their website!